Hosts Barbara and Tony Windt flank Ben Hoffman (holding Troy) and the winners of the Raptor Rescue Sheild Trevor Edley (rear), Paul Blackman (holding the sheild) and Andrew Ryan (second from right). The fourth member of the team Dave McKenzie wasn’t present for the award ceremony. 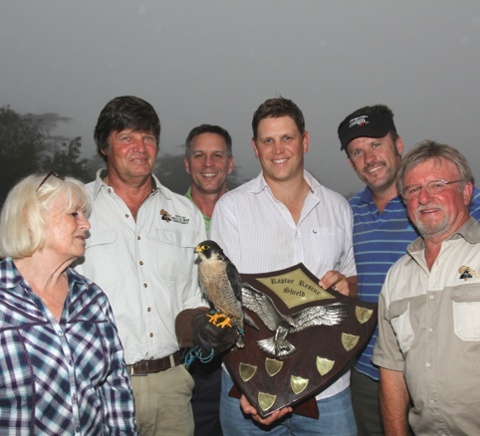 Camelot Conservancy once again hosted their annual Raptor Rescue Golf day on November the 16th 2012 and fifty golfers took part in the fundraiser. Organized every year by Tony and Barbara Windt this was the seventh year that the conservancy has donated funds to the on-going effects of raptor rescue and rehabilitation. True to tradition, drizzle and mist shrouded the end of the event, but spirits were not dampened and R 8000 was raised for the sick and injured birds. Our thanks go out to all the golfers who supported the event, to the sponsors who provided the prizes and to the kind efforts of the Windts.